From crockery emblazoned with official portraits to solar-powered toys with the queen’s characteristic wave, Britain’s monarchy is big business. And now that royal economy is kicking into high gear around the engagement of Prince Harry and Meghan Markle. LONDON — The cameras had barely finished flashing on the newly engaged Prince Harry and Meghan Markle. But Emma Bridgewater, a British ceramics manufacturer, was already making a mug to commemorate the royal moment. The next week, just under 1,000 mugs — with “Harry & Meghan are engaged,” and the date of the announcement on them — were on sale. They retailed online for around 20 pounds ($27) and sold out within 24 hours. From crockery emblazoned with official portraits to solar-powered toys with the queen’s characteristic wave, Britain’s monarchy is big business. And that royal economy, normally catering to tourists and enthusiasts, kicks into high gear around major events. “It’s a flash of color in a rather gray world,” said Bridgewater, the eponymous founder of the ceramics company. Britain’s royal family will contribute an estimated 1.8 billion pounds to the country’s economy this year, according to Brand Finance, a consulting firm. The bulk of that was 550 million pounds from tourism. Brand Finance estimates that travelers in town for Harry’s wedding, scheduled for the spring, will bring an additional 500 million pounds next year. Roughly one-tenth of that amount is expected to come from merchandise sales. Enthusiastic collectors like Margaret Tyler are a discerning audience. 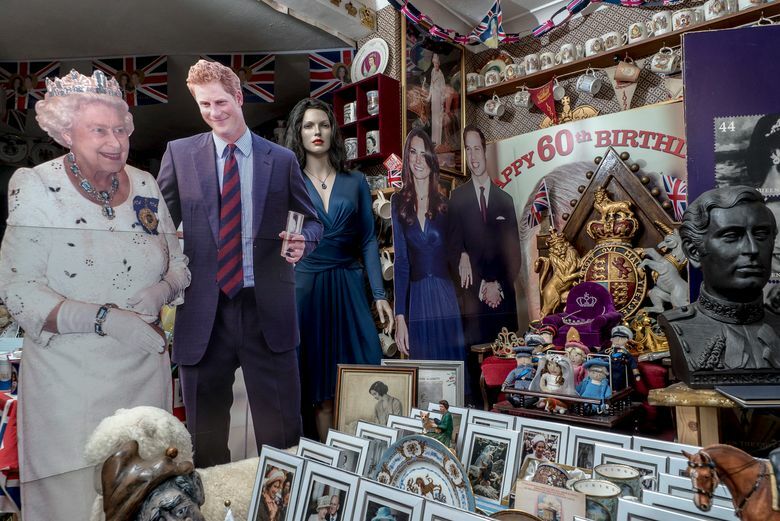 A dedicated royalist, Tyler, 73, has filled her home in northwest London with commemorative items, including a copy of the Issa dress that Kate Middleton wore during the announcement of her engagement to Prince William, and a little glass dish with a picture of Queen Elizabeth II that started her collection. One of her rooms is dedicated solely to Princess Diana, and another to the queen, which she rents out for 75 pounds a night. Insurers have valued her collection at 40,000 pounds. Royal fever is a capitalist tradition in Britain. Royal Crown Derby, a porcelain manufacturer, has been making commemorative products since the coronation of King George III in 1760. Jan Hugo, a 59-year-old collector with 10,000 pieces who is based in New South Wales, Australia, has teapots dating back to Queen Victoria’s reign. “I think they just look for an excuse to be able to do it, every time there’s a birth, wedding, engagement, anniversary, anything,” Hugo said. When William married in 2011, the high-end British department store Fortnum & Mason sold a Wedding Breakfast Blend tea from Kenya, where he proposed. The Lego-themed amusement park Legoland made a brick replica of Buckingham Palace, complete with the bride, groom and assorted well-wishers. Pizza-delivery chain Papa John’s even turned their faces into a pizza. Bridgewater’s company has sold more than 35,000 pieces of pottery based around William’s wedding and has produced 15 different commemorative mugs for events ranging from Prince Andrew and Sarah Ferguson’s wedding, in 1986, to the birth of William’s second child, Princess Charlotte, in 2015. The company has annual sales of about 20 million pounds. The merchandise this time around is extensive. Bridgewater has another mug and tea towel planned for the wedding next year, as well as a mug to celebrate the third child of William and Catherine, the Duchess of Cambridge, due in April. Royal Crown Derby has a series of designs in the works, like a heart-shaped tray for 75 pounds and a 150 pound octagonal plate finished in gold. The company began planning four months before the engagement was officially announced as gossip swirled in the British press. To put the finishing touches on its fine bone-china products, the company is now waiting for specifics, such as whether Markle will use her given name, Rachel. “One of the things that the collectors insist is that it has that level of information and detail applied to the design,” said Steven Rowley, Royal Crown Derby’s sales and marketing director. As royal fever grows, the company plans to hire an additional 10-15 people. It is also hoping to tap into heightened interest in the United States — Markle is American — to push its products in places like Bloomingdale’s and Bergdorf Goodman.